Warmer oceans spawn stronger hurricanes and typhoons: typhoon Meranti is a Category 5 typhoon (and may have been a Category 6 if such a category existed). 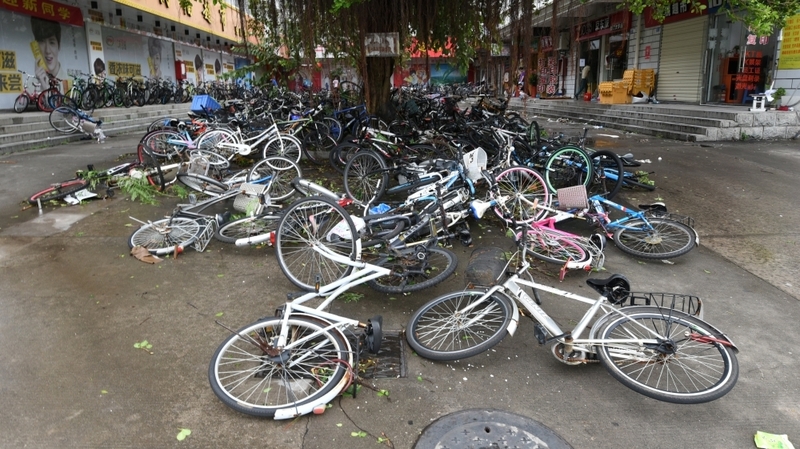 After battering parts of Taiwan it made landfall in the Chinese province of Fujian. Wind speeds are down from the peak of up to 370 kph (230 mph) but still high enough to wreak plenty of havoc. 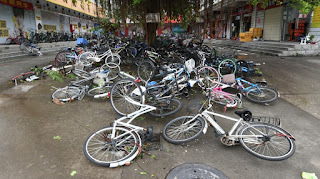 Photos are slow to emerge, but the one that caught my eye is of a square in the city of Xiamen: in the middle of the square is a large heap of bicycles that have presumably been blown over by the high winds. I find it noteworthy for two reasons: apparently in this city of 3.5 million the bicycle is a viable mode of transportation (unlike in, say, Shanghai where they have largely been displaced by cars). As usual, I'm struck by the sheer number of bicycles that can be parked in a medium-sized square. If all those bike owners had come by car, that square would have been hopelessly snarled in car traffic 24/7, and nobody can play, chat, and socialise the way people do on car-free squares. I'd say that Xiamen is not behind the times, but at the cutting edge of the transportation transition: countless cities and towns are re-thinking their roads and taking them back from the dominance of the car. What is even more noteworthy is that an editor has chosen this photo to illustrate the typhoon's aftermath, whereas (have you noticed?) usually the picture is of cars: cars floating in flood waters, cars swept onto roof tops, cars crushed under fallen roofs. I find it ironic that the car, one of the largest contributors to the global warming that is fueling the extreme weather, is depicted as the victim of that extreme weather. Because the truth is that it's no big deal to pick up those bikes and start riding them again, unlike a crushed or drowned car that requires quite a bit of work - if it's not totalled altogether. Note: in the photo, the bikes parked next to the walls didn't even fall over. Sure, cars are heavier than bikes and a better illustration of the forces of the elements. Typhoon Meranti has surpassed that, thoough, judging from the footage of a stack of dry containers in Kaoshiung, Taiwan, that got stirred around like so much sand. A standard dry container weighs about 3000 kg empty, or about the weight of my Volkswagen Golf. This is the age of battening down the hatches, the cars, and the empty containers. And beloved old bridges. And the bicycles: the vehicles of choice for climate resilience.